Seoul Semiconductor (KOSDAQ:046890), a leading global innovator of LED products and technology, announced that it and Seoul Viosys Co., Ltd. (collectively “Seoul”) have successfully resolved two patent infringement lawsuits filed in the U.S. Federal District Court for the Central District of California against Archipelago Lighting, Inc. (“Archipelago”), a company that sells LED light bulbs. In 2017, Seoul filed the first patent infringement lawsuit against Archipelago for infringement of 12 LED patents covering various aspects of Seoul’s long-established Acrich technology. A few months later, Seoul filed a second patent litigation against Archipelago accusing additional products of infringement of 8 other Acrich technology patents. In the lawsuits, Archipelago acknowledged that LED components used in its LED light bulbs were manufactured by several third party suppliers. Although Archipelago had no knowledge of any Seoul Semiconductor patents, or the possibility of infringement, Archipelago did not dispute that the LED light bulbs in question infringed Seoul Semiconductor’s patents. Archipelago also did not dispute the validity of the relevant Seoul Semiconductor’s patents and agreed to pay a license fee in order to affirm its commitment to respecting the intellectual property rights of others. Based upon these admissions, the California Central district court entered judgments in favor of Seoul in these cases. Seoul’s asserted patents include technologies for LED drivers for high-voltage operations, Acrich MJT (multi junction technology – over 6V high power chip), filament LED bulb structures, LED packaging, LED epitaxial growth, and LED chip fabrication. Seoul is the pioneer of Acrich technology that enables high-voltage operation with a high power output using only a small number of LED units. 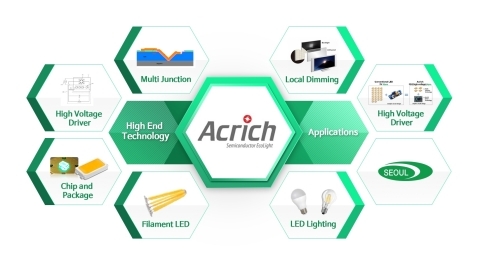 Specifically, Acrich technology utilizes proprietary LED driver technology to enable high-voltage operation, as well as proprietary MJT technology for mounting and integrating many LEDs within a small area. This maximizes the available space in LED products and power efficiency by 20%, facilitating a simple circuit design and significantly reducing the size and cost of LED products. Seoul Semiconductor develops and commercializes LEDs for automotive, general illumination, specialty lighting, and backlighting markets. As the fourth-largest LED manufacturer globally, Seoul Semiconductor holds more than 12,000 patents, offers a wide range of technologies, and products such as SunLike – delivering the world’s best light quality in a next-generation LED enabling human-centric lighting optimized for circadian rhythms; WICOP – a simpler structured package-free LED which provides market leading color uniformity and cost savings at the fixture level, providing high lumen density and design flexibility; NanoDriver Series – the world’s smallest 24W DC LED drivers; Acrich, the world's first high-voltage AC-driven LED technology developed in 2005, including all AC LED-related technologies from chip to module and circuit fabrication, multi-junction technology (MJT); and nPola, a new LED product based on GaN-substrate technology that achieves more than ten times the output of conventional LEDs. UCD constitutes a high color gamut display which delivers more than 90% NTSC.